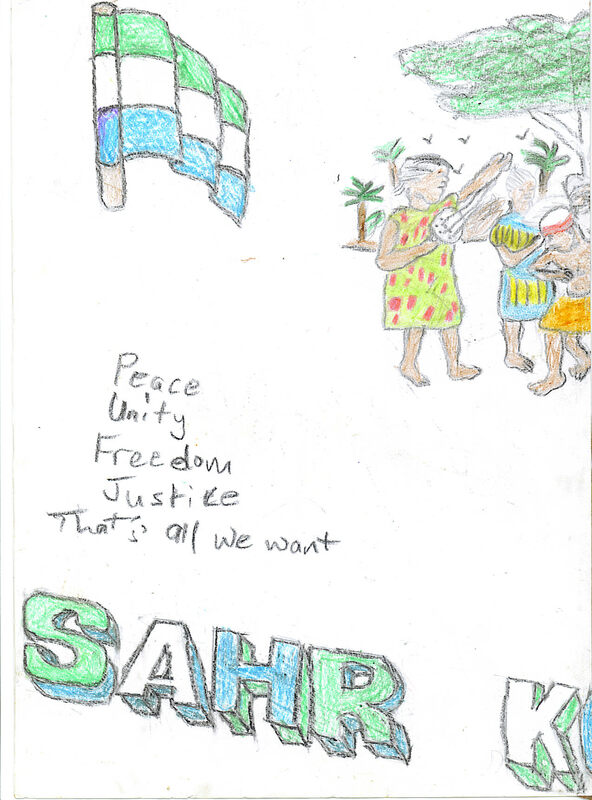 Thank you so much to Sahr Kondo Wi for this drawing to represent young people from Sierra Leone. “Its worth knowing that trees have a special significance in family life, and the cotton tree (that can grow very large) is particularly important in Sierra Leone. The concept of the ‘family tree’ is both literal, in that people gather their families around and under particular trees to eat, work etc, and symbolic in referring to the extended family” says Nick Marshall. Nick spent several months at this school as a volunteer teacher. Nick also said these children live a very basic life where in most places there is no running water. The walls of the school are plain concrete with no pictures on them. The civil war had wrecked the infrastructure of the country and things are improving slowly. For Nick to be able to return to the U.K. and turn the tap on was fantastic! Just a reminder of how lucky we are. The green stripe represents agriculture, the country’s natural wealth and its mountains. The white stripe stands for justice and unity, and blue represents the Atlantic Ocean and the harbour of Freetown, the country’s capital. Copyright © 2010 to 2015 SchoolsInternationalPeaceQuilt, All rights reserved.